Let’s face it, our bodies simply weren’t designed to walk around with a 20-pound machine protruding 2 or 3 feet off our hips. What I’m talking about is using a chainsaw, and when you think about it that is exactly what you do when you’re operating one of these machines. All that extra weight can create significant wear-and-tear on your body, especially if you’re using one on a fairly regular basis. Most days I have enough trouble just trying to walk around on my own two feet for eight or nine hours, so the added burden of having to carry around a chainsaw for at least a couple of those hours can really have an impact on the muscles. The manufacturers of chainsaws aren’t blind to the fact that these can be quite hard on the body and that’s why most of them have incorporated some features that will reduce that wear-and-tear at least a little bit. In the rest of this article we’ll take a closer look at some of the things they’ve done to try to reduce the potential physical harm to those using their chainsaws. The first chainsaw was invented around 1830 and that was before electricity and internal combustion engines became the driving forces behind our modern existence. This chainsaw was operated by a hand crank and it couldn’t have been more ergonomically WRONG on the body. Fortunately, we’ve come a long way since then and today we don’t have to worry about ratcheting a hand crank to get our chainsaws working. Today chainsaws are designed with our comfort in mind. For example, most chainsaws feature a two-part handle design that has been created with the ergonomic structure of our bodies in mind. What that means is that when we hold that chainsaw it doesn’t feel unnatural. Today’s saws are designed to conform to our natural posture so that when we use them the physical impact on our body is minimized; we’re not using them in an unnatural position. Don’t get me wrong, after using a chainsaw for several hours you’re going to feel it, but you’d feel it a lot more if the handles weren’t ergonomically designed. Any chainsaw with an internal combustion engine is going to weigh a lot more than an electric or battery-powered option. Many manufacturers focus on the factors that make electric and battery-powered saws more lightweight as a key benefit that’s less taxing on the body. If you do have physical limitations you may be best to look at one of these chainsaws as a viable option. 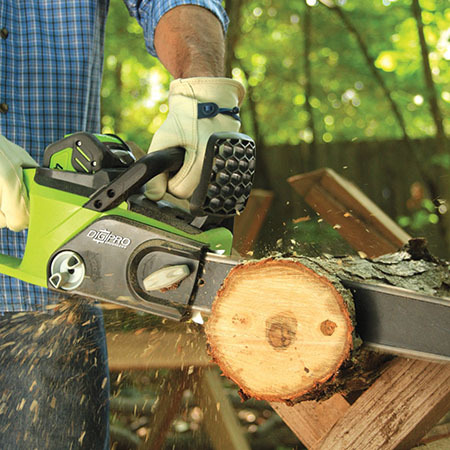 It might not be as powerful as a gasoline-powered chainsaw, but if you’re only using it in your backyard to trim a few branches it will provide you with the power you need to get the job done. If you are going to choose a gasoline-powered model it’s important to shop around – there are many manufacturers that have tried to minimize the weight of their chainsaws because of its impact on the body. You can typically find an electric chainsaw that weighs between 8 and 12 pounds. You won’t find a gasoline-powered chainsaw that light, but you may find one that’s under 20 pounds. It’s important to consider your own physical limitations and shop around until you find a machine that fits your needs. If you’ve ever used a chainsaw you’re probably well aware that the vibrations can be quite difficult to deal with. You can feel it right through your body, and in some cases you may feel your teeth chattering just a little bit. It’s quite an experience, and not necessarily a positive one. In recognition of this fact, many manufacturers include anti-vibe technology. This often includes things such as rubber padding and foam around the engine housing that prevents the vibrations produced by the internal combustion engine from reaching your hands and affecting your body. They may also include extra soft padding on the handles to minimize the impact of the vibrations on your body. Each manufacturer handles this problem a little differently, but if you take a close look at the manufacturer’s specifications for the chainsaw that you’re thinking about buying, you’ll probably find that most of them have some kind of anti-vibe technology built into their design. One last thing I’d like to talk about isn’t really a feature of the chainsaw itself. How you stand can have a significant impact on the wear and tear of your body when using a chainsaw. It’s important to keep two feet planted on the ground at all times to maintain balance and reduce the possibility of any awkward movements. Normally it’s best to have one foot slightly in front of the other as this will create the steadiest platform for you to work with. This may seem like such an obvious thing to mention, but you’d be surprised at how many injuries happen simply because of the way people stand when they work. The main point of this article is that almost all modern chainsaws have built-in features that are designed to minimize the impact they have on your body. Sometimes it’s a good idea to pay a little extra money if that’s what it takes to get a tool that is better for your physical health. Most of us only think about our physical health when using power tools as an afterthought, but it should always be one of the first things we think about. If you keep all of this in mind when you’re using your chainsaw, your back and shoulders will probably thank you in the long run.